Yes, we will receive our shipment as normal on Christmas Eve. But we will close early at 4 P.M. should business be slow. Please call to confirm if you plan on shopping late, 501-791-4222 for Collector's Edition, and 501-227-9777 for The Comic Book Store. 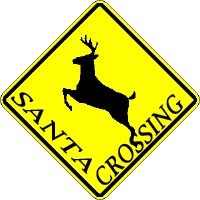 And... as always on Christmas Eve... please be careful at all Santa Crossings. Reindeer are notorious for not yeilding right of way. Have a Merry Christmas and Happy Holidays!